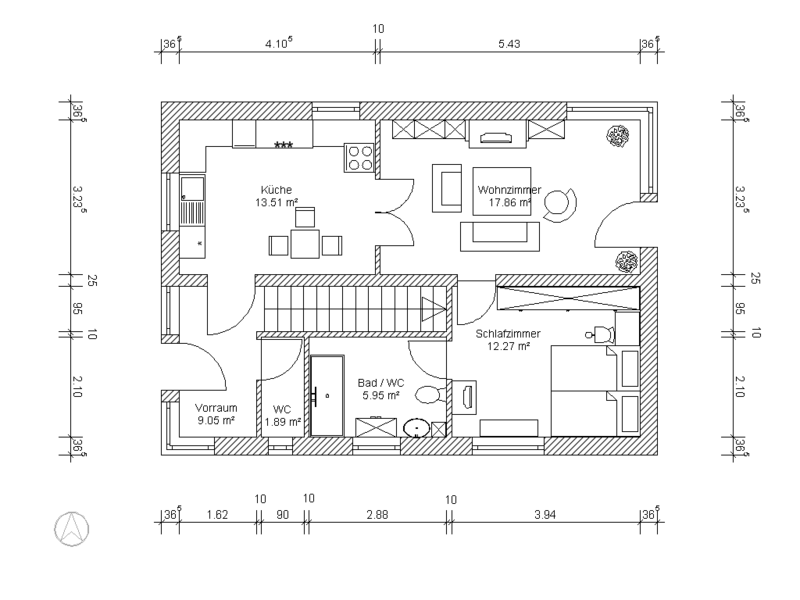 Would you like to know the best way to draw your entire floor plan on your own? We will show you a way to draw and design your floor plans in order to achieve the desired results quickly and without any detours. You have already decided on a house layout and you also know how your house should be built and which material (house type) should be used. 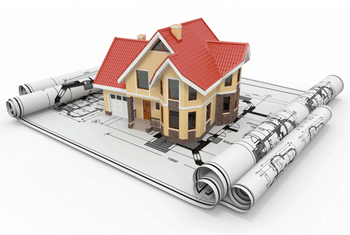 Regarding the preparation of drawing floor plans we will distinguish between two types. You already have a slight idea of the dimensions of your house but you don't know the desired amount of rooms, the floor-to-floor height and the exact dimensions of the outline and the interior spaces yet. In this case it is useful to simply test different alternatives and draw the floor plan using the house plan software program. You can try out different dimensions and wall thicknesses, change walls (you can move, extent, shorten them) and find your ideal layout. While testing it it is not important to put every little detail such as the room description or the floor in the right position - what is important though is finding the exact dimensions of the external and internal walls with the corresponding wall thicknesses, finding the approximate dimensions of the windows and doors, and their positions as well as defining the floor-to-floor heights. The next step is that you define the dimensions of the house by means of chain dimensioning for the external and internal walls by necessary documents and save the project. Afterwards you start a new project and draw the floor plan with the defined dimensions again. You already have the exact dimensions, positions and wall thicknesses of all the walls. Then you can start a new project. Because the walls of your house are most likely not in the modular dimensions, switch off the grid. You can also disable the display of various line widths because this is only important when printing the plan. Then start with the actual input of the external walls. For this purpose, you must first generate an auxiliary line grid for the external walls using horizontal and vertical auxiliary lines (maybe in one color). Afterwards you can change to the input of the external walls - define the wall thickness with a right mouse click (maybe also layer composition) - and then hover over every single auxiliary line interface that occurred. You can change the wall axis using the hot key CTRL-W. In order to receive exact horizontal and vertical walls, in addition to the input via mouse, you can keep the CTRL button pressed. You can follow the same procedure to draw the internal walls. First define the auxiliary line grid via horizontal and vertical auxiliary lines - maybe with a different color. Then you can change to the input of the internal walls and hover over every single auxiliary point that has occurred. In the case that a wall has been designed too short, just delete the wall and put it in again or extend the wall using the feature "edit walls". Adding pieces of walls of the same wall thickness (wall segment) can have a negative effect on subsequent automatic calculations and in the input of windows. The reason: When putting in windows in walls that are added in pieces, each cut wall segment has to be as long as or longer than the width of the window. Only when ALL walls have been put in and no other changes will be made, can you define the final name and labeling of the rooms. For this purpose, after selecting the room, click the right mouse button, go to properties and change the standard room name in the following dialog for instance to living room, bed room, kitchen, bathroom or WC. You can display different additional labels in the section labeling in the same dialog and at the same time. In addition to the input of walls (internal and external walls, movable walls, virtual walls), drawing floor plans also includes the input of doors and windows. After selecting the window and door, click with the right mouse button in the character area and select properties. In the following dialog you can define the dimensions of the doors and windows. You can also arrange the sash bars of the windows in this section. The windows and doors are positioned by the inserted auxiliary lines or by construction aids (right mouse click -> construction aids) When the window or the door is located at the cursor you can change the reference point (left, right, center) prior to the input with the hot key CTRL-W.
Dimensioning the drawn floor plan. 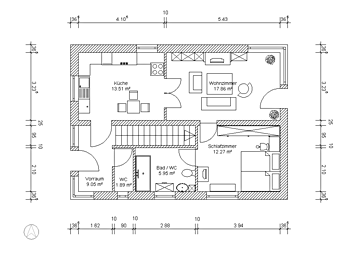 cadvilla is a professional software to draw floor plans. Draw your floor plans with cadvilla professional. Drawing floor plans with cadvilla is quick and easy. Cadvilla is the ideal software for drawing your floor plan on your own and for quickly gaining a first insight into 3D.